… unless you’re handing me a picnic basket! Aren’t we over labels yet? I know it makes our brains feel more comfortable to classify things but in the yoga community, really? Something rubs me the wrong way with this the same way I used to be corrected in the service industry when I would call someone Mr. and they would say “it’s Dr.”. We all want recognition, it’s a human condition. Many of us spend endless amounts of time and money to obtain it – that’s the justification I would give to those Doctors correcting me before heading out of view to roll my eyes. In yoga though, we are taught to let go of titles and roles. That who we were prior to showing up on our mat is a story and who we connect with on the mat is beyond a name. I teach that respect and dignity should be what we offer everyone we come into contact with from the CEO, to the famous musician, to the homeless guy asking for change on the street. As someone seeking truth, I truly believe we are all equal here with something to offer the world. 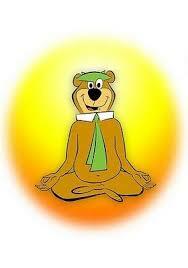 In a community of “Yogi’s” we inherently ostracize those who are not. Heaven forbid if you don’t own a mala bead necklace, can’t pronounce sanskrit or hold a handstand long enough for Instagram to prove your worth. As teachers we should be including everyone and when we throw around proud terms of our exclusivity – we aren’t doing our jobs. By definition, a Yogi is a practitioner of Yoga. So, technically, yes, I fall into this category. It’s just that in this practice of bringing into union all that I am, I would rather not be defined or categorized.